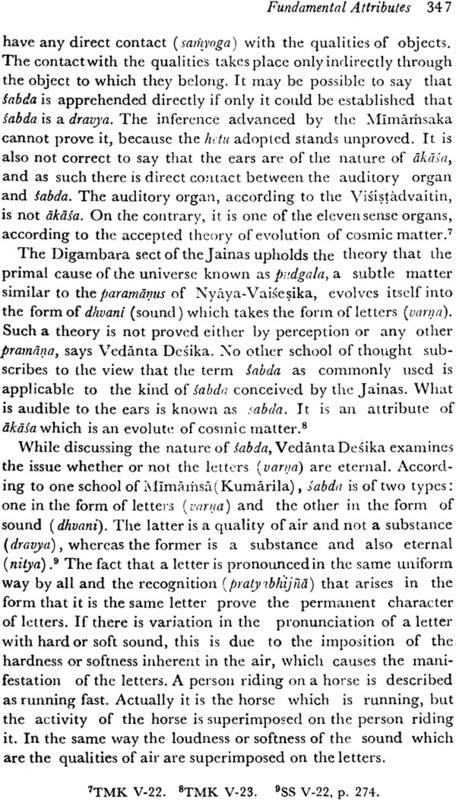 The doctrine of Visistadvaita, expounded by Ramanuja, was developed into a sound system of philosophy by the most brilliant of his successors, Venkatanatha, 'popularly known as Vedanta Desika.' His chief contribution to the intellectual foundation of the system lay in the composition of the text of Tattva-mukta-kalapa, a treatise of significant philosophical import left for posterity. 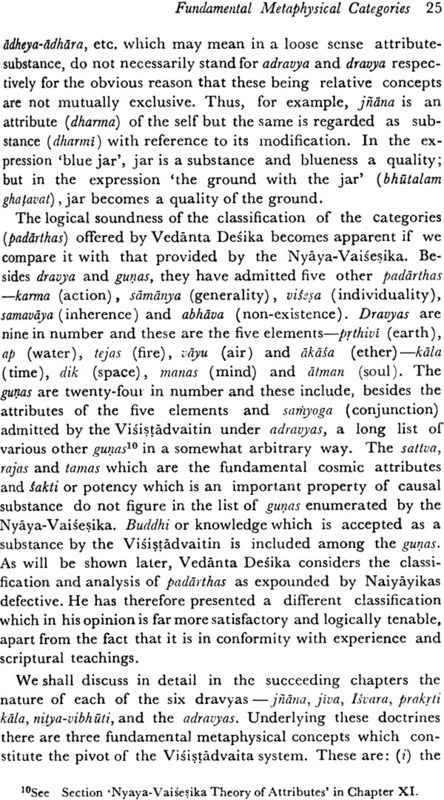 In this volume, which is a study of Visistadvaita based on Tattva-mukta-kalapa, the line of arguments advanced by Vedanta Desika is closely followed. 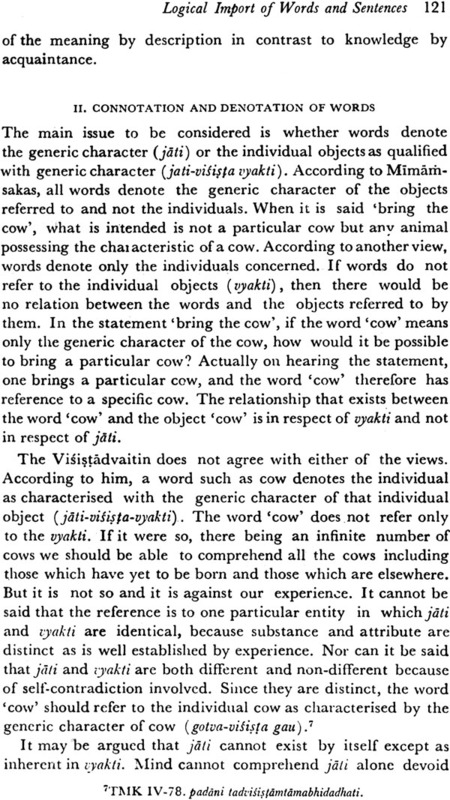 The major and important issues related to the philosophy of Visistadvaita are brought within the purview of discussion. The contemporary rival schools represented by Carvakas, Buddhists and Jainas, Nayaya-Vaisesikas, Mimamsakas and the Advaitins, of both orthodox and unorthodox camps, are successfully encountered. 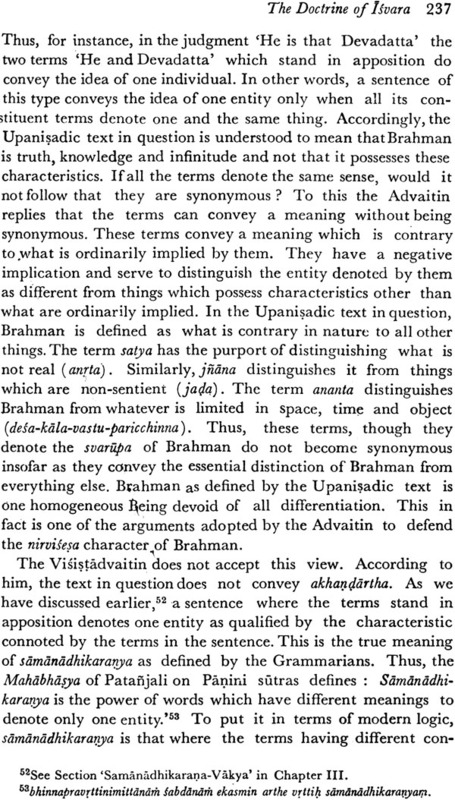 In the textual light of Tattva-mukta-kalapa, the notion that Visistadvaita is a theological system is dispelled, and its philosophic core is established beyond doubt. The author maintains 'the original orthodox style, so characteristic of the ancient Acaryas', in his delineation of topics; yet the exposition remains free from all kinds of scholastic trappings. common to all schools' both I the East and the West makes its appeal to those interested 'in understanding the basic problems of philosophy'. S. M. Srinivasa Chari (b. 1919, Mysore) has a brilliant academic record. He is an M. A. in Philosophy of the University of Mysore and recipient of Ph.D. from the University of Madras. He is a finished Sanskrit scholar trained up by eminent traditional teachers. He was a research Scholar at the University of Madras and a Fellow of Institute of Philosophy at Amalner in Maharashtra. Dr. Chari joined the Ministry of Education, Government of India, after the completion of his university career. He retired in 1976 as Joint Educational Adviser. 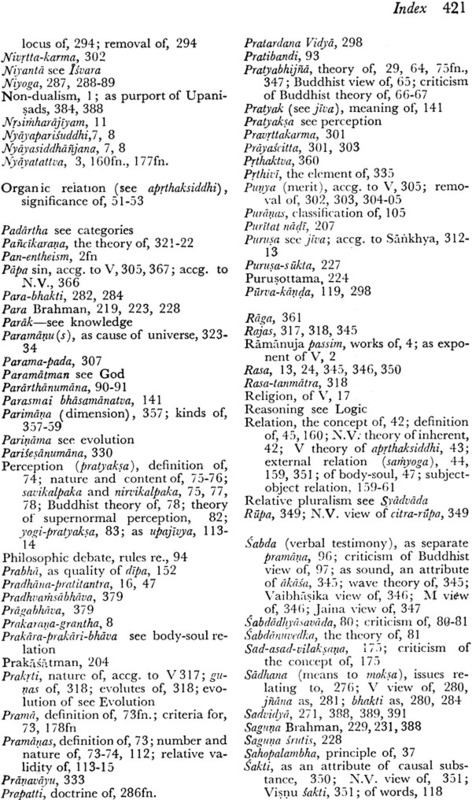 Visistadvaita is one of the great religio-philosophical systems of the world. 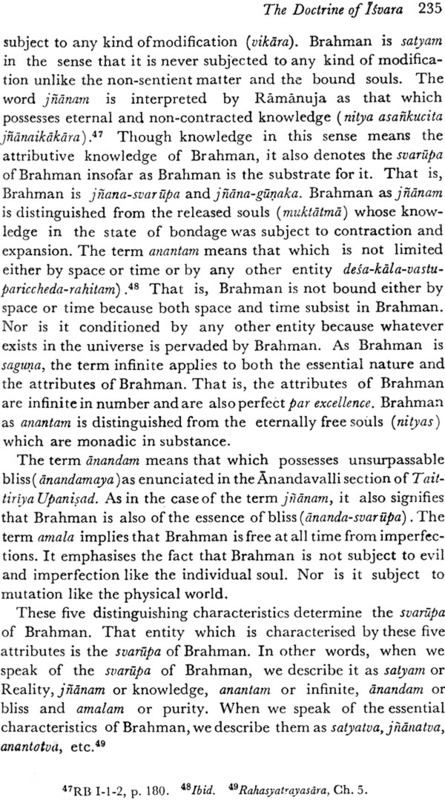 There are very few modern critical expositions of it based on the bhasya, supplement by later erudite works. 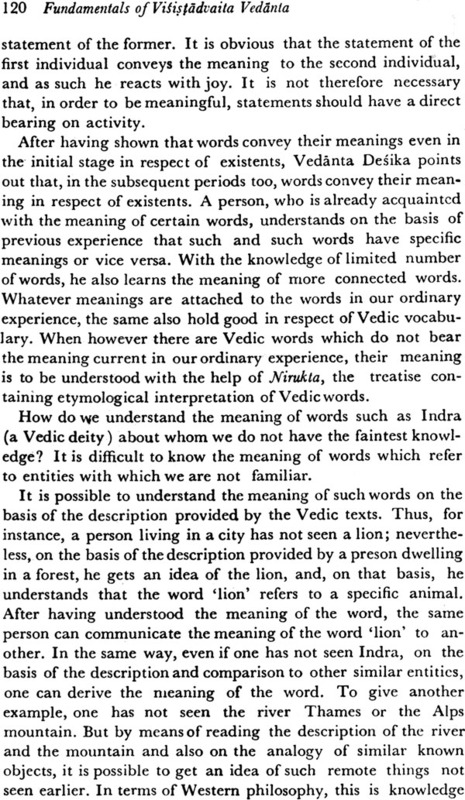 Dr. Srinivasa Chari has acquired quite a profound knowledge of Visistadvaita from great pundits with whom he studied for years the texts in original. His modern education has endowed him with the capacity to present classical ideas in a lucid and connected way. 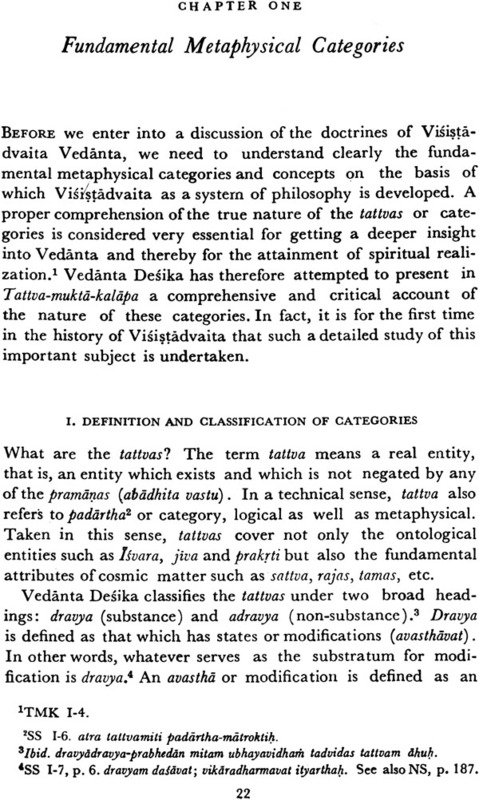 Depending on the original texts, in particular on Vedanta Desika's Tattva-mukta-kalapa, Dr. Chari has written an excellent monograph which authoritatively expounds Visistadvaita. Moreover, it attempts to establish that this a system of philosophy in conformity with logic and experience. This Book attempts to present in a systematic way the fundamental doctrines of Visistadvaita Vedanta associated with Sri Ramanuja based on the study of Tattva-mukta-kalapa, the magnum opus of Sri Vedanta Desika, who was one of the most distinguished successors of Ramanuja. Although in recent years quite a few books have been written in English on the philosophy and religion of Ramanuja, Visistadvaita as a sound system of philosophy has not received the treatment it deserves. 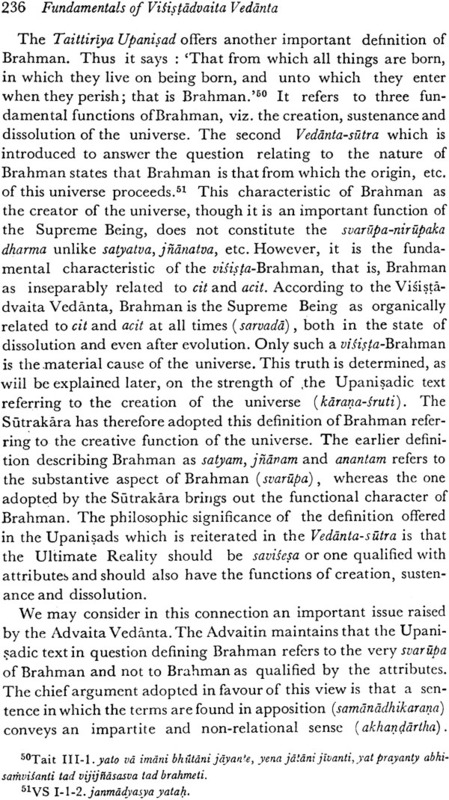 The emphasis placed by Ramanuja on the acceptance of savisesa Brahman or the personal Supreme Being endowed with attributes as the ultimate Reality of philosophy on the strength of the scriptural evidence has led some scholars to feel that Ramanuja's system is essentially theological.Theology, understood in the correct sense as an enquiry into the nature of God, is no doubt an important part of Visistadvaita, even as it is in the case of many other Indian philosophical systems. 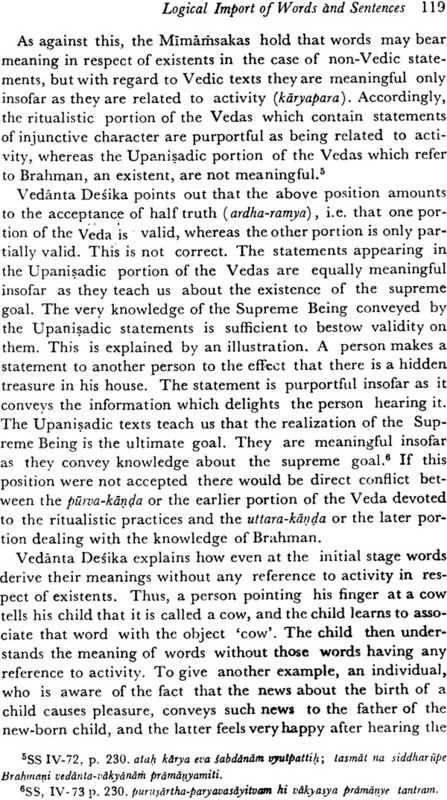 But the Visistadvaita system has both a philosophical as well as theological aspect, and the former is of greater importance for the reason that it gives meaning and value to the latter. The meta- physical doctrines, developed by the Visistadvaitin on the basis of which the system is founded, cannot be understood easily unless one has made a deep study of ancient treatises in the original. 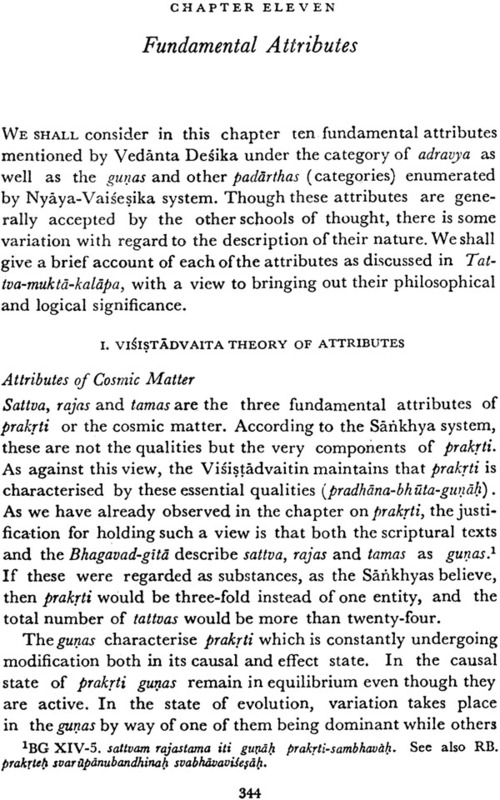 Next to the Sri-bhiifYa of Ramanuja, there are two out- standing philosophical classics, Tattva-mukta-kalapa and Satadusani, written by Vedanta Desika. A study of these texts is an essential prerequisite for getting a deeper insight into Visistadvaita tenets. But these are highly technical works written in terse Sanskrit and presented in the classical style replete with subtleties of dialectical arguments. The two texts have therefore remained beyond the approach of ordinary scholars and modern students of philosophy. It is significant that, barring passing references to the works, an authentic translation of them has not been attempted in any European language. Even among the existing scholars, brought up strictly in the traditional disciplines of scholarship, there are very few who can claim to have studied them fully. 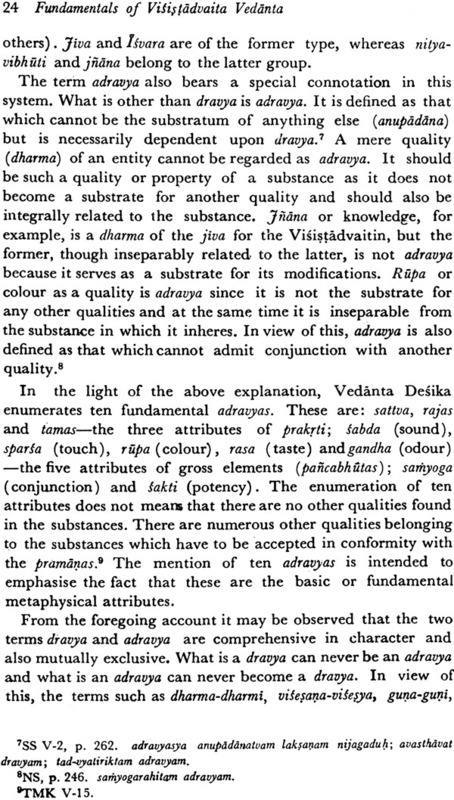 Realising the importance of these two treatises for a fuller understanding of Visistadvaita, I published in 1961 a book, Advaita and Visistadvaita, covering a study of Satadusani, which is an important polemical work. I have now attempted to cover Tattva-mukta-kalapa, the other important classic, in the present book. The main objective of this task is to remove a prevalent impression that Visistadvaita is primarily theology and establish that it is essentially a system of philosophy. I t is a system which has been developed, apart from an appeal to scriptural authority, on the basis of well-formulated epistemological, ontological, cosmological and religious doctrines. 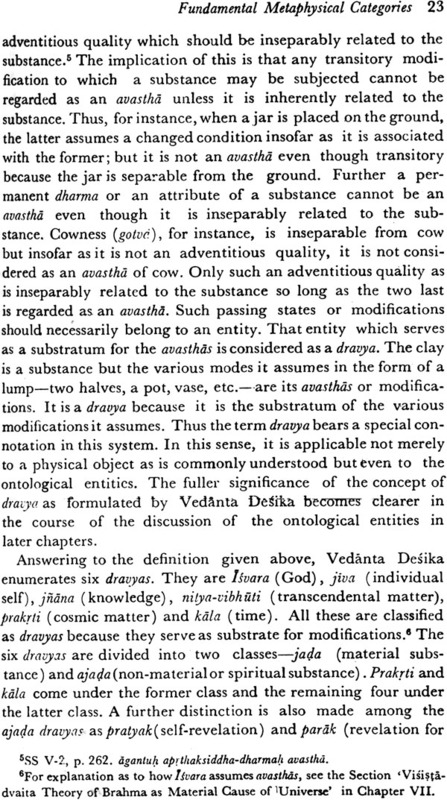 If there is a single authentic work in which this fact has been demonstrated, it is in Tattva-mukta-kalapa of Vedanta Desika. 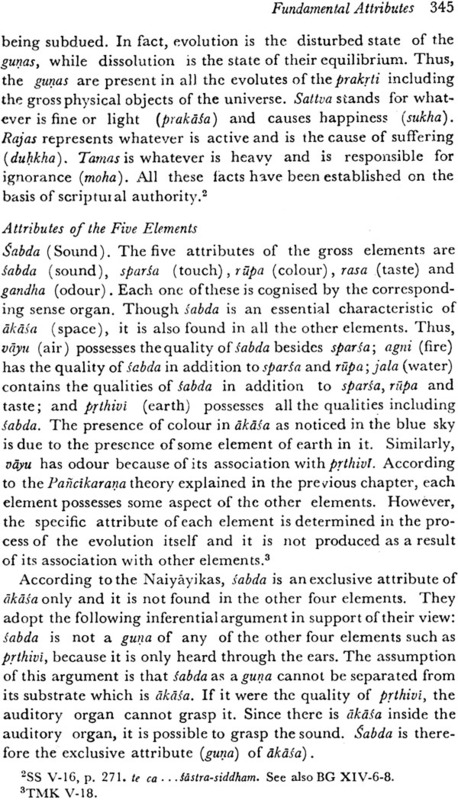 The scope of this book is not confined to an exposition of Tattva-mukta-kalapa. Nor is it aimed merely at presenting a narrative account of Visistadvaita philosophy and religion. 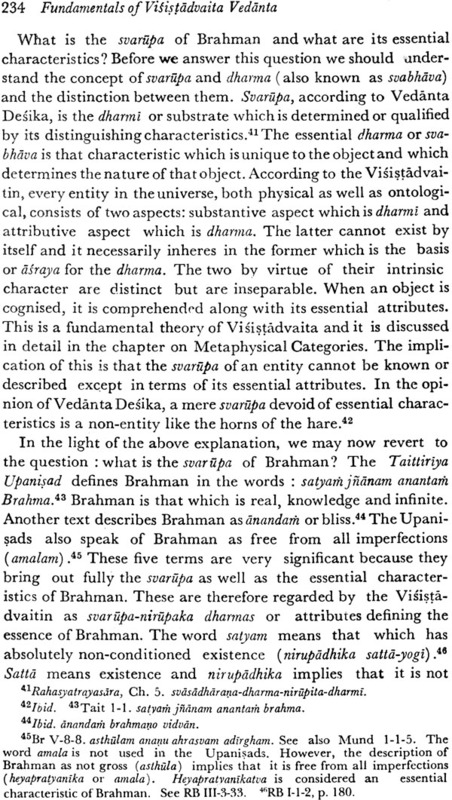 On the basis of the rich material contained in the original Sanskrit text, I have endeavoured to present a critical and comparative account of the basic doctrines of Visistadvaita in their logical sequence. In discussing these doctrines, I have paid greater attention to the underlying issues in order to bring out their philosophic significance. I have therefore avoided, to the extent possible, appeal to scriptural authority. I have also tried to present the doctrines in their original orthodox style, so characteristic of the ancient Acaryas, and therefore refrained from temptations to use the familiar concepts of western philosophy by way of comparison, because this can often prove misleading. 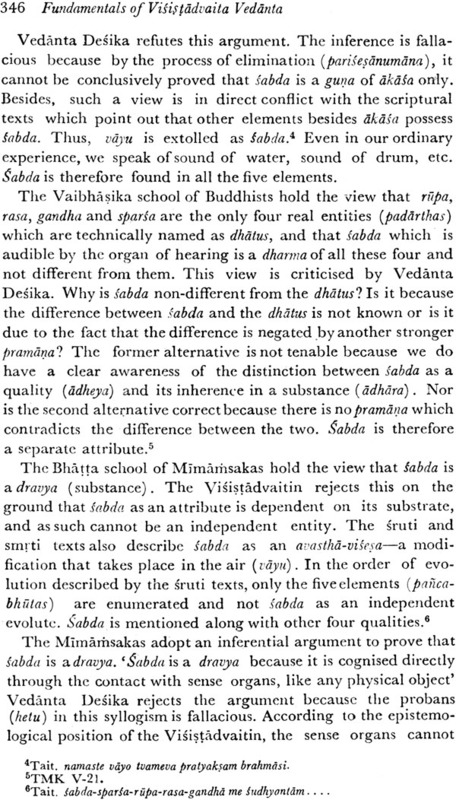 So far as I am aware, it is for the first time that an attempt is being made to present in English the Visistadvaita doctrines comprehensively on the basis of this authoritative text. Anyone interested in an in-depth study of Visistadvaita Vedanta will find this book invaluable. The doctrines discussed in the book are related to the fundamental epistemological and philosophical issues, which are common to all schools of philosophic thought whether in the East or the West. The book will therefore be useful to a ll those who are interested in understanding the basic problems of philosophy. 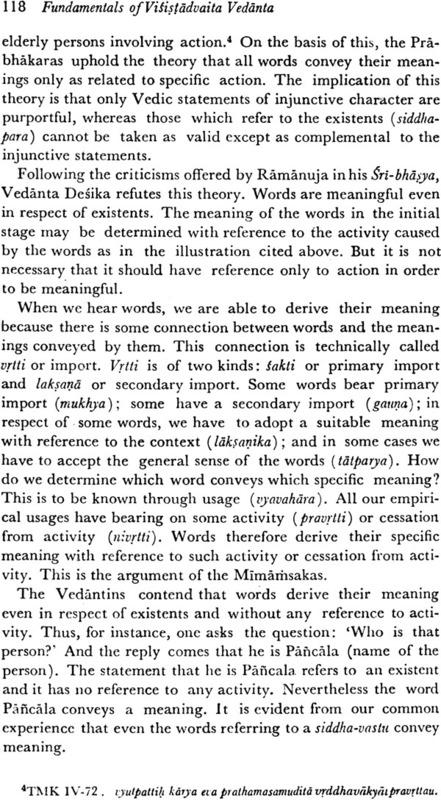 In a work of this type it is difficult to avoid the use of technical terms in Sanskrit. I have however tried to minimise their use.Wherever I have adopted the Sanskrit words in the body of the text for want of an appropriate English equivalent, I have given the nearest English equivalent. Wherever I have used English terms, I have also given in bracket the Sanskrit words to avoid possible misunderstanding. 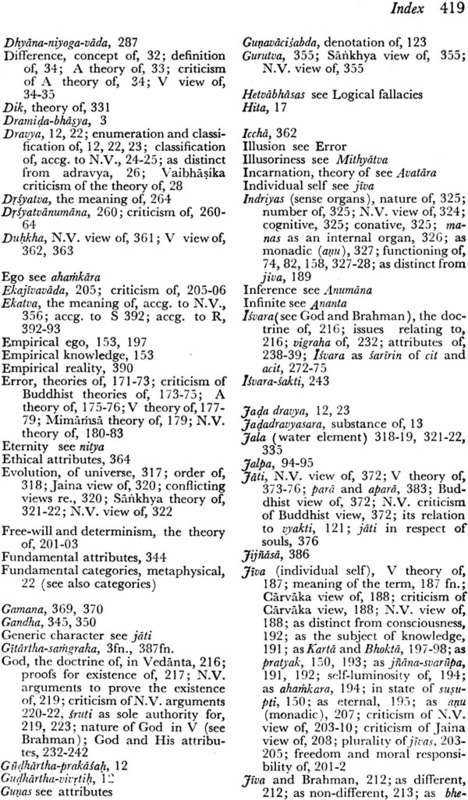 Sanskrit quotations used in the body of the book have also been explained in English. 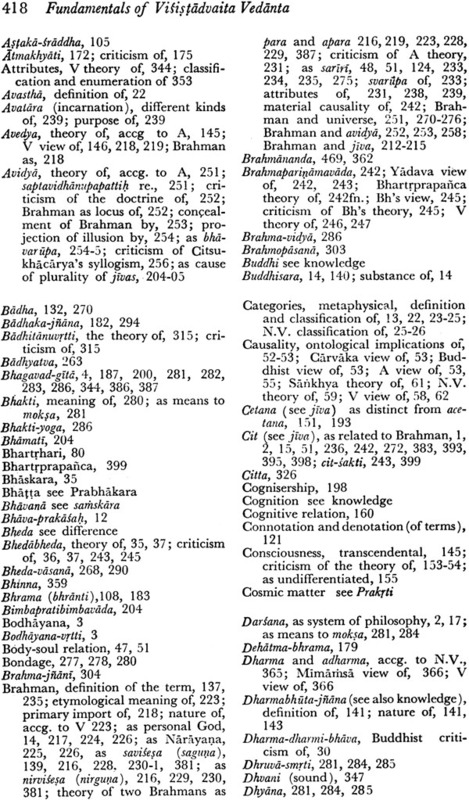 Except the commonly used words, all Sanskrit words have been diacritically marked. 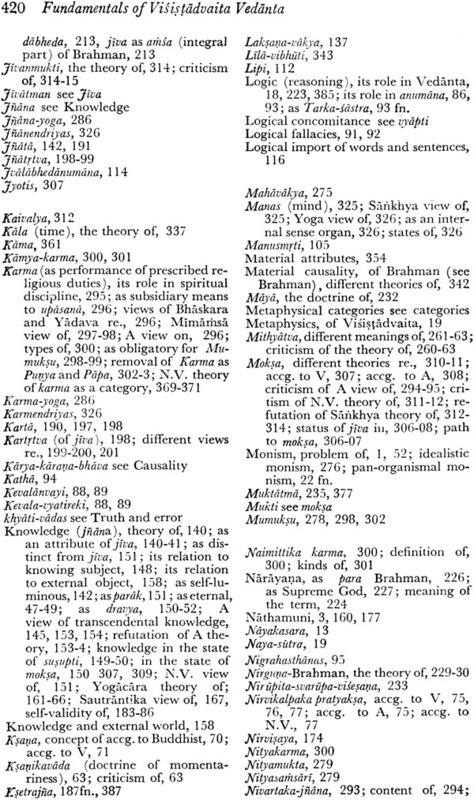 I have also given a glossary of the Sanskrit terms. I have taken special pains to express the highly technical subject matter in as simple and lucid manner as possible, so that even lay readers should have little difficulty in understanding the book. In the preparation of this book I have confined my study mainly to the original Sanskrit works on Visistadvaita, drawing material primarily from Vedanta Desikas Tattva-mukta-kalapa and the commentaries thereon, Satadusani, Nyaya-siddhanjana and Nyaya-parisuddhi as well as Ramanuja's Sri-bhasya along with Sruta-prakasika. The other books consulted are indicated in footnotes. I have also consulted the leading scholars in South India on Vedanta in an attempt to make this book as authoritative a version of the Visistadvaita doctrines as possible. I hope the book will be a useful contribution to the study of philosophy in general and Vedanta in particular. It is with great pleasure that I record my obligations. I must first pay my respects to my revered guru, the late Sri Gostipuram Sowmyanarayanacharyaswami (1878-1943), under whose feet I had the rare privilege and fortune of studying Vedanta in the traditional manner. But for his initiation into the essentials of the Visistadva ita philosophy and his blessings it would have been impossible for me to accomplish the study of Satadilta1Ji and Tattva-mukta-kalapa. I also owe my success in the present undertaking to another guru, the late Sri Madhurantakam Veeraraghavacharyaswami (1900-83) under whom I studied the original text. I am deeply indebted to both these Acaryas. I should also pay my respects to His Holiness Abhinava Ranganatha Brahmatantra Parakalaswami (1884-1966) whose blessings received in my early age have enabled me to understand Visi~tadvaita philosophy. Though I could not study directly under him, I have had the opportunity of receiving considerable knowledge and benefit in the preparation of the present book from three of his learned disciples-Sri Saragur Varadachar, Sri K. S. Varadachar and Sri E. S. Varadachar, As a token of my gratitude to them and also in recognition of the unique contribution made to Visistadvaita Vedanta by H.H. Parakalaswami by his scholarly commentaries on Sri-bhasya and Tattva-mukta-kalapa, I respectfully dedicate the book to him. I owe a debt of gratitude to Prof. S. Srinivasaraghavan who was kind enough to go through the entire manuscript and offer valued criticism and helpful suggestions. I am also grateful to my esteemed friends, Prof. L. V. Rajagopal and Sri S. Srinivasachar, who have read through the entire typescript and made useful suggestions for improvement. I should also thank Prof. S. s, Raghavachar, Dr. N. S. Anantharangachar, Sri K. S. Krishna Tatachar and Sri A. Srinivasaraghavan who looked through a portion of the typescript and offered useful comments. Prof. T. R. V. Murti, who recently passed away, went through the typescript and came out with a number of valuable suggestions. I express my indebtedness to the departed soul. My thanks are due to all those who have helped me in one way or other .and, in particular, to my wife without whose loving co-operation. I would not have been able to complete this book. I should also express my grateful thanks to the esteemed Professor K. Satchidananda Murty for evincing keen interest in my work and for graciously writing the Foreword.